Yesterday was a a typical March spring day, gray and rainy. I used the indoor time to sort my pantry. I want to make sure that I rotate preserves, use what I’ve stored and slowly make room for our exciting new harvest. First, I soaked some Borlotti Beans and started a broth base for them. In the broth, I crisped up some bacon from the “family visit” weekend, added molasses, onions, smoked paprika, Ms. M’s dehydrated garlic chips, a jar of our vegetable stock and a bottle of my BBQ sauce from 2013. My head was singing … “put another log on the fire, cook me up some bacon and some beans, go out to the car and change the tire, wash my socks and mend my old blue jeans … then come and tell me why your leavin’ me”. It turned out excellent! I topped our bean soup with fresh guacamole & salsa, then frozen a few containers for future meals. While foraging in the pantry, I also found several bags of dehydrated tomatoes. Seeing the tomatoes reminded me that I had recently purchased a Basil plant at the local grocery store. The Basil was growing happily, and wildly, on our south-facing window sill. Humm, tomatoes and basil? I immediately thought, “It’s time to brew some Sun-Dried Tomatoes”. My tomatoes weren’t actually sun-dried, instead I used a dehydrator in August when my tomato harvest was peeking. I stored the dried tomatoes in air-tight bags and have been using them in soup and stews throughout the winter. To build Italian oil-based Sun-Dried Tomatoes, I began by washing 4 pint jars. Then, I added several leaves of fresh Basil, some dried oregano, touch of salt and 3-4 cloves of peeled garlic into each jar. I sliced the dried tomato rounds into useable pieces and loosely filled the jars. Once the jars were full, I topped the jars with good quality Organic Olive Oil. It takes a fair amount of Olive Oil to fill each jar, but I will reuse it in salad dressings and other things. I stored the jars in a dark place at room temperature, giving the herbs and garlic time to infuse and the oil time to rehydrate the tomatoes. 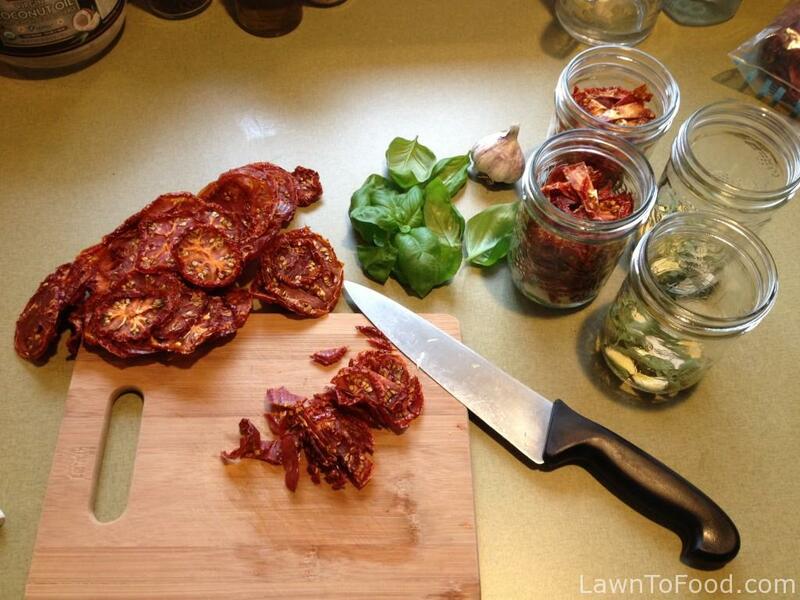 This entry was posted in Let's Eat, Preserving & Using Preserves and tagged dehydrator, sun-dried tomatoes by Lynda. Bookmark the permalink.